With the significant improvements introduced within our Source Framework, we have been working hard on transforming all our themes onto this excellent framework. The momentum continues today with one of our most popular themes – Blognews – being updated to the latest framework. Thousands of users are already taking advantage of Blognews and they’ll be happy to know that the update includes streamlined code, better organization, and excellent widgets to further enhance your site. Using theme options panel, you can set most recent posts to display on featured slider or posts based on a category, specific user-defined tag, or custom field values. Included are several custom page templates ready to use. For example, page templates include Blog, About, Media, and Services pages. Continuing with the ease and flexibility motto, the theme also offers several Gabfire widgets which can be positioned throughout dozens of widgetized areas on the home page. If you are already running Blognews, then feel free to download the updated version. However, if you are looking for the perfect theme to start an online newspaper or magazine, then look no further. Blognews comes equipped with everything you will need – just ask the thousands of users who use it for their sites. Now it’s even better and more powerful on the Source Framework. 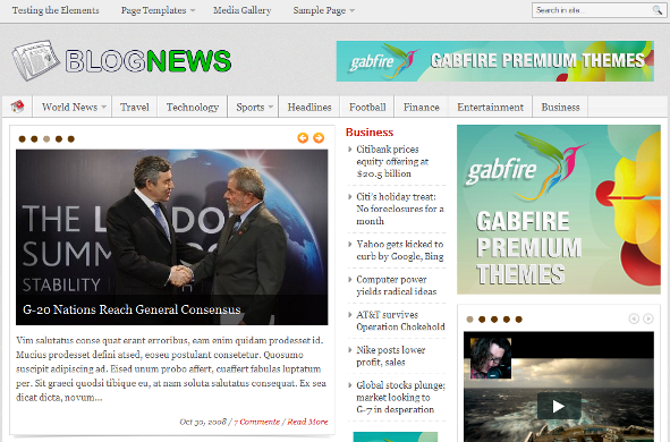 Take a look at the Blognews demo or purchase this amazing theme. One Response to "BlogNews WordPress Theme Gets Updated"
This is another excellent theme GabFire magazine, I'm currently using the transcript, I'm totally satisfied ! !